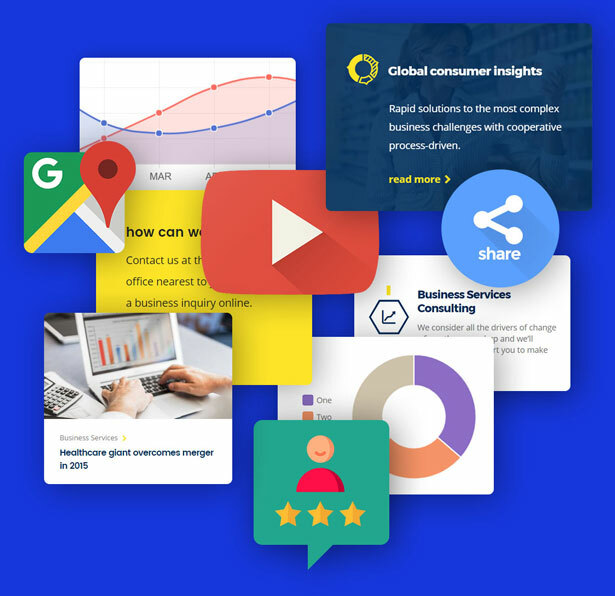 It is really a high time to make one’s name bigger ever since in the corporate world, competition is already immense and rising like a twisted tide, so in order to make an organization top-notch no stone should remain unturned. Now the owners are much mindful of their online presence and are helping out people in a much greater way than ever. We have done a deep research on Consultancy and Finance business. Now we have a thorough idea about what features should your website adhere. 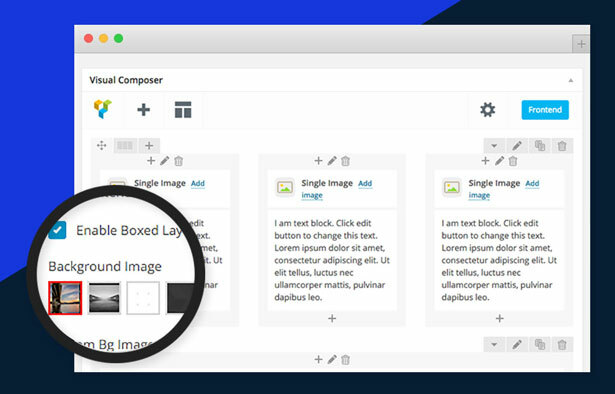 You can easily edit the real content of your website and compose the page layout with ‘drag and drop’ page builder. 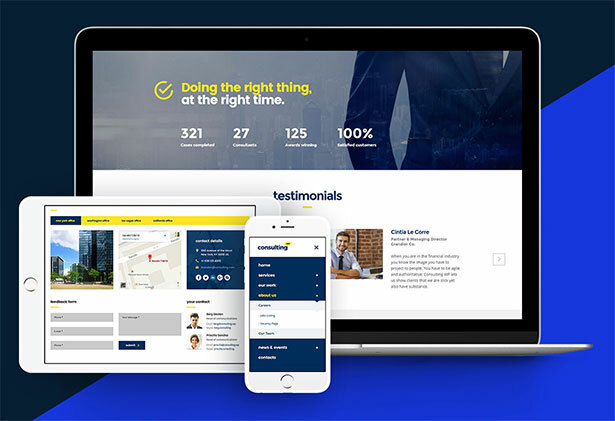 Visual elements of a website page make its significance vital; image(s) and text are very well synchronized in this WordPress theme, there are several website layouts readily available for you to choose in accordance with your website’s stance. You will never regret the functionality of the website theme, as it is swift, professional and responsive. 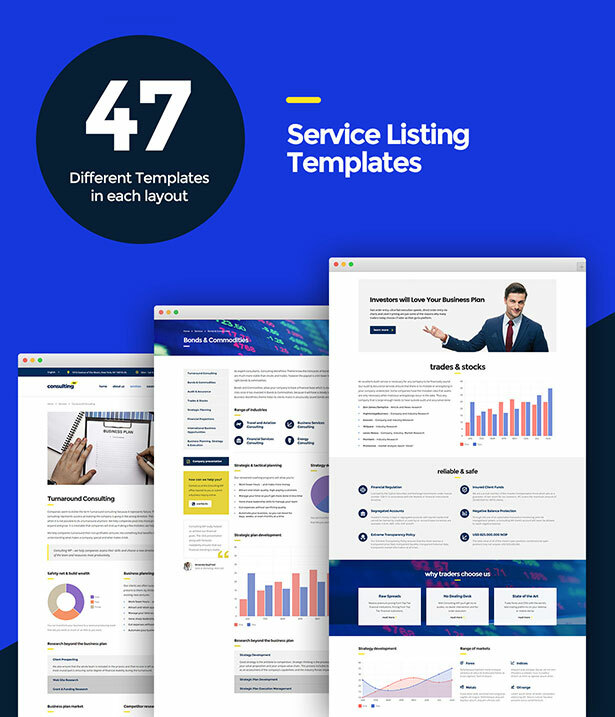 There are 47 elegant templates available in every demo layout giving you a powerful insight that how things work in the business/finance WordPress theme. The functionality standards and high quality is very well maintained throughout all the theme layout templates, so no glitches may occur. 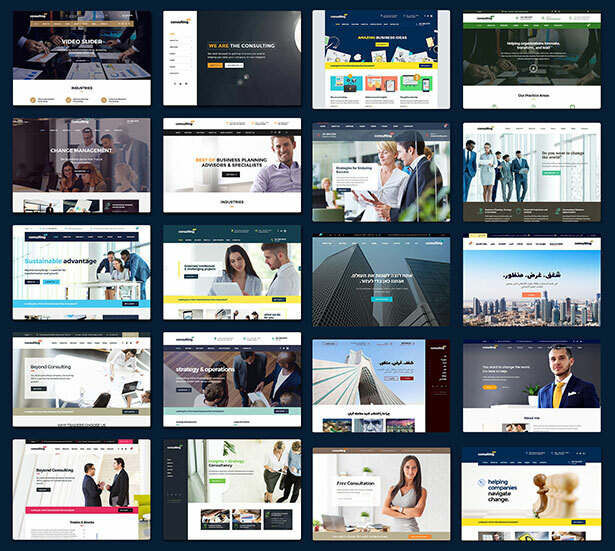 There is a wide range of header designs available making website look stunning and eye-catchy, including the menu bar changes to the image/picture and logo of the company variations. It is up to you how you want to go about things. 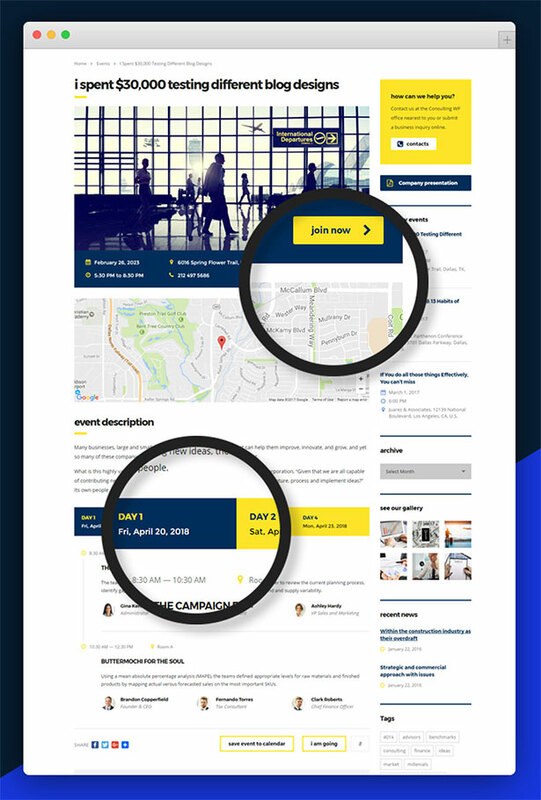 Now there is not much of a need to create an event outside of your blog, it becomes tough at times to manage the traffic of social media, therefore this feature is so handy and yet very useful to create and run events on the same place – on your very own website. Schedule events, venues and its timing like never before. No need to take the hassle and confusions when one can sit back home on a coach and getting oneself reserved an appointment all through and straight away via online website. One can ask for appointment directly with no nerve-wrecking long queues and waiting mode. 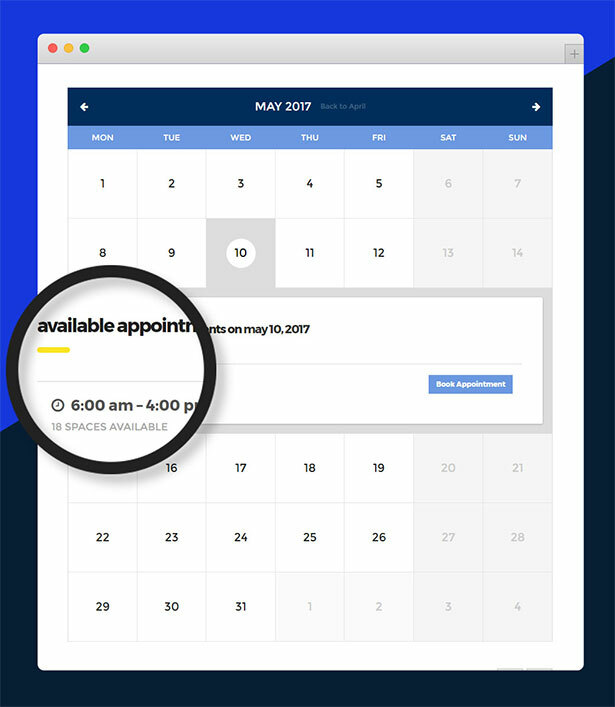 There is an easy access to date/time/month of appointment, isn’t it amazing? Things are becoming easier as we are heading towards the deeper understanding of how the business/finance WordPress theme works. 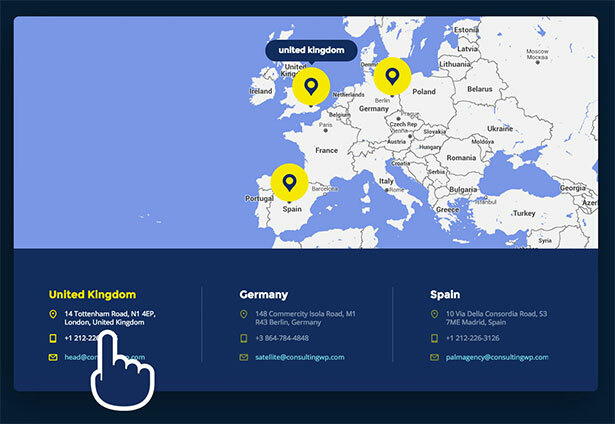 You may share a number of locations of the offices situated all across the globe to give people an idea how far-fetched your branches/outlets are spread over and how they can be easily accessed by just sending the location directly to you smartphone. Easy-mapping, No? Here comes the punch, through this responsive theme the website gets easily and perfectly adjusted to any screen size, width/length and resolution of the device. No elements are ever hidden, this actually is very helpful in smart SEO. 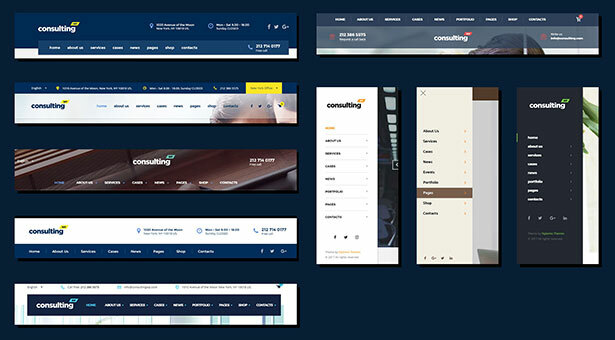 With Retina readiness, you can go for larger scale previews with crystal clear previews of your web pages. Want to make quick changes and alterations on the website? Well without applying them directly to the website just make a quick “preview” out of it to see how does the changes look like (before changing it in real time). WHOA, this is simply amazing. No hassle, no ambiguity and nevertheless an easy-going approach.